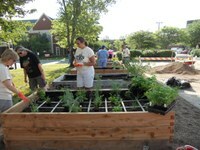 Join us in UofL's organic garden for our group workdays! Learn (by doing) how to grow vegetables all year-round in our greenhouse, aquaponics system, and outdoor beds! Anyone can work in the garden any time, but we'll gather together every Monday at 1pm from Jan. 16th to Apr. 24th. No prior experience necessary. Tools & gloves provided.